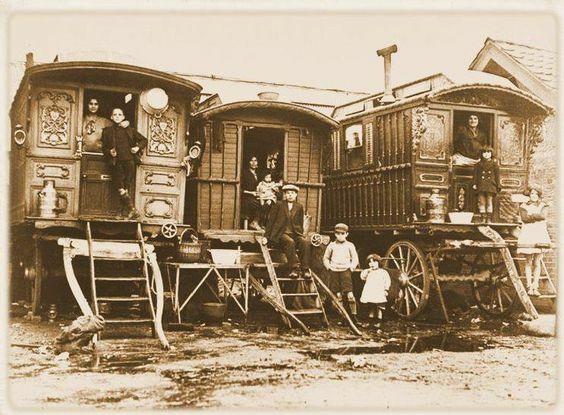 A Gypsy family lived in our caravan for at least the first 80 years of its life. It would have roamed the British country side pulled by a horse and be home to a family, often with many members. The wagons were passed down through the generations and were dearly loved and cared for. Romany Gypsies can trace their origins back to a group of people migrating from the Indus Valley in Rajasthan, India approximately 1500 years ago. The Romany Gypsies are an ethnic group who now mainly live in Europe. Over the last 150 years the livelihood and living situation of these travelling people has changed dramatically. The ‘Horse drawn, painted, one roomed house on wheels with a stove’ is believed to originate in France in the early 19th Century. Its Romanesque characteristics, its baroque carvings and bright colours are likely to have been picked up from wanderings in Central and Eastern Europe. The same folk art and symbols can often be seen in art work in Poland, Romania, Turkey, Iran, Afghanistan, Pakistan and India. 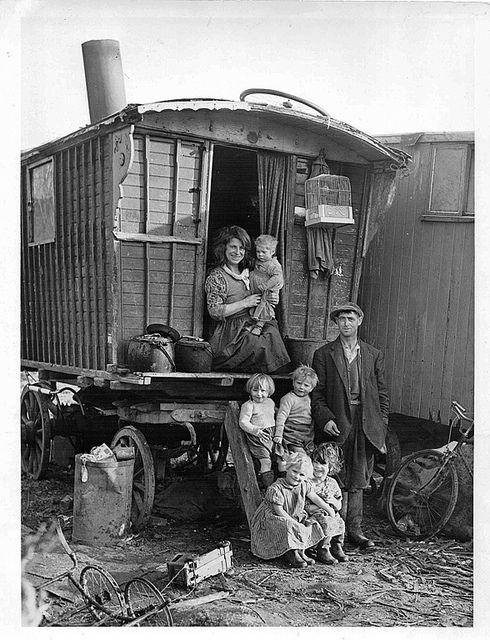 The Gypsies of Britain would have originally travelled in carts and lived in tents, or benders. In Britain the earliest known picture of a Gypsy Caravan is dated 1840. The Gypsies of Britain would have originally travelled in carts and lived in tents, or benders. In Britain the earliest known picture of a Gypsy Caravan is dated 1840. In the first half of the 20th Century Gypsies and Travellers lived in beautifully decorated horse drawn wagons and would travel the British Isles, often in a convoy of caravans. They exemplified craftsmanship and folk art of the highest order and a wagon is often a Gypsy's most prized and valued possession. There are many different types of wagons; Readings, Duntons, Ledges, Bow Tops. Our Gypsy Caravan was created by H. Jones of Hereford in 1892 and it is a Burton wagon. H. Jones, Wheelwright and wagon builder, began around 1870 building farm wagons, carts and living wagons for Gypsies, hawkers and tradesmen. He built Ledge and Burtons and in 1924 when he closed his business he had probably made more wagons for Gypsies and Showmen than anyone else in the south – west. In 1955 two 28 year old women, Margret Warriner and her friend Pamela Chadwick had a dream to take to the road. They bought this old gypsy caravan in an Junk yard in Twyford for £100. It was in need of a complete restoration and the young women stripped back the old maroon coloured paint work and repainted the wagon in Yellow, Blue, Red and Green. The Gypsy Caravan toured the villages and small towns of the West Country. It rolled along the English country lanes being pulled by a tractor. Margret Warriner and her friends, (pictured) served tea and cake to the charmed folk that frequented these gatherings. As families, young couples and children wandered through the delights of the fairs, cakes were sold and tea was severed in china cups out the back of the wagon. 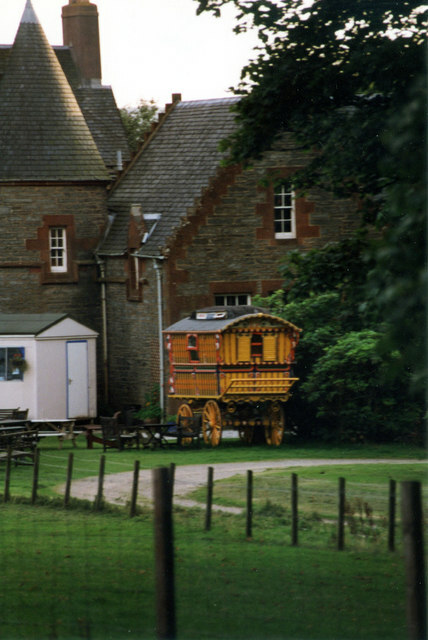 The Gypsy Caravan was then generously left to the James family in 1994 by Margret Warriner to live on the coast of Kintyre, in Scotland. The James children grew up playing in the caravan and it became their Wendy house. Many fine hours were spent frolicking with imaginary pots being stirred and fires being stoked. Occasionally the children would spend the night in the wagon, piling into the old wooden bed unable to sleep for shear excitement as they slept together under the cold Scottish skies. For almost 15 years the wagon was parked outside the Seafood Cabin, in Skipness. While families and tourists came to eat local sea food at the Seafood Cabin the Caravan could be enjoyed. It was adored by every child that came into its realm and many would spend their summer holidays playing inside and underneath its grand old frame. In 2008 Clemmie James brought the Caravan down to Kent to be part of The Romany Life Centre for Culture and Education run by Romany Gypsy couple Henry and Paula Stanford. The family welcomed the Caravan and Clemmie onto their site and generously shared their knowledge and tradition with her. Though most Travellers today live in trailers, Henry and Paula had an exquisite collection of traditional Gypsy wagons and artifacts that they opened to the public to demystify and share their culture. The couple are well known in the area and work with local schools explaining their culture, history and heritage as well as teaching traditional crafts to children. It was here, one afternoon while Clemmie was painting the wagon and a group of school children were being given a workshop in traditional cooking over a fire, that Clemmie’s friend Theo sat on the front ledge of the wagon and began playing his guitar. The school children wondered over and surrounded the front of the wagon. It was this moment that the seed of turning the wagon into a touring theatre was planted. In 2010 The Gypsy Caravan moved on again, in bad need of attention as its wheels were almost falling off, it found its way across Kent to Croford Coach Builders and Wheelwrights . Here, Edward Crouch and his team, Tim and Nick using traditional techniques made a new set of wooden wheels. Due to financial strains any further restoration work had to come to a standstill and it patiently sat in the old workshop awaiting its next chapter. In the meantime Clemmie began her own journey of engaging support and interest with artists, theatre directors, performers and programmers to create. The seedling of an idea to turn the wagon into a community touring Theatre was now beginning to sprout a tiny shoot.